Palestine Starting XI: Rami Hamadi; Musab Al-Battat, Abdelatif Bahdari, Mohammed Saleh, Fadi Salbees; Mohammed Darweesh, Odai Kharoub (Mohammed Yameen); Ahmad Maher Wridat (Oday Dabbagh), Sameh Maraaba, Islam Batran (Rami Musalmeh), Tamer Seyam (Mohammed Natour). Recap: Palestine and Iraq met for the first time since meeting at Canberra Stadium during the 2015 AFC Asian Cup. This time, Basra's international stadium played host to the two sides in a game that was missing the vociferous Iraqi support that was on display during recent friendlies. 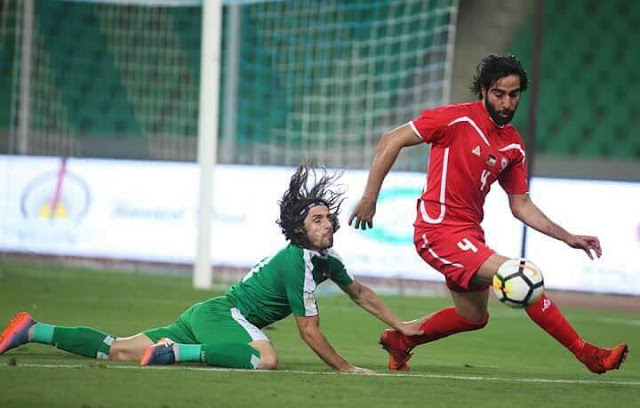 In a complete turn of face, Palestine put together a competent and confident first half that was far from the dour display against Oman. Interim manager Noureddine Ould Ali handed a starting role to Odai Kharoub and Islam Batran for the first time in their short national team careers. The former made his presence felt early, picking up a yellow card just six minutes into the match. While the latter showed off his blistering pace by breaking the Iraqi offsides trap and winning a free kick as he made a B-line towards the goal. After early half chances, the game was played at a comfortable pace. Palestine managed to cope with the speed of Mohanad Ali but defensively were exposed as a unit that could be beaten by quick attackers. Iraq's best chance came as a result of this weakness- Rami Hamadi's sweep of an attack was mistimed but his defence recovered to maintain the scoreless tie. Shortly thereafter Jalal Hassan made an excellent double save to deny Ahmad Maher and Sameh Maraaba. Palestine had several other chances in the second half- including an effort that hit the post. Sameh Maraaba was the main culprit in terms of wasted chances; failing to score with three good looks at goal. With 10 minutes left and with Palestine's best attacking threat, Islam Batran, subbed off; Al-Fida'i took up a defensive posture and saw out the result with little trouble. What I liked: A competent performance that should have been rewarded with a goal. Jalal Hassan bailed out his teammates on more than one occasion. The national team needed this type of performance (and positive result) after the disastrous Julio Baldivieso experiment produced the worst national team showing in years. The team played well and players who were given a chance in place of regular starters will feel they are closer to a place in the squad for the upcoming Asian Cup. What I didn't like: The scheduling of the game; It would have been nicer to see a full Basra Stadium. Stat Attack: This match marked the first time Palestine managed to hold Iraq scoreless and is only the third time in 13 tries. What's Next: Palestine will make the short trip south to face Kuwait. Olympic team defender, Michel Termanini is expected to link up with the squad for the game.